Young archaeologist Anna Windsdoe learns that her missing father, a great explorer, was looking for a secret city. Determined to find him, Anna is about to set out on an exciting time-management adventure! She’ll meet wonderful friends, confront terrible enemies and overcome impossible obstacles on this incredible journey! Help Anna find her father! 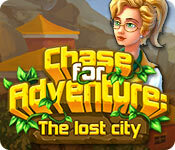 Chase for Adventure: The Lost City is rated 3.3 out of 5 by 39. Rated 4 out of 5 by TheDoctorIsHere from Solid Game, Not Special, Terrible English -- But Fun! This is a solid game. I love it, it's the one that made me fall in love with gathering resource/pathway type games, although now that I'm replaying it I find I've definitely played better games in this category. It's definitely a solid, good game, with some qualities I definitely look for in these type of games. First, you can queue actions. I tend not to play these games if I can't queue actions, so that's a big one for me. Second, the resource production automatically goes into your bank, which I definitely like -- I hate sending workers to pick those up nonstop, since you have to factor that into the level time. The graphics are fun. The storyline, as others have mentioned, is nothing particularly special, and I found myself, even on the first play through, skimming it instead of reading it properly. I am big on games with stories, so it's rare that I skip through -- I watch every cutscene in every game but the story was so bland I couldn't be bothered. There are definitely better stories out there. The English is, as others have mentioned, terrible. It's not as bad as the sequel, as it is at least understandable, but if you are a grammar fiend, do not bother with this game. Overall, it's a fun game, nothing particularly special. I'd recommend trying the demo. If you haven't played resource gathering/pathway games before, this is a good one to start with, since it's not a particularly challenging one, but does have some challenge, and it's pretty cute. Rated 4 out of 5 by Bookercat1972 from Okay but held my interest I was disappointed by quality of this game. The people who designed it obviously don't speak English and didn't bother to have it checked out before they released it. There are different levels of difficulty and you can play at your own speed or try to beat the clock. There were some levels I had to play over a few times to get everything accomplished before the timer ran out. The music is nice, not annoying. Story line is good I would recommend the game but just understand it isn't quality like the Roads of Rome series. 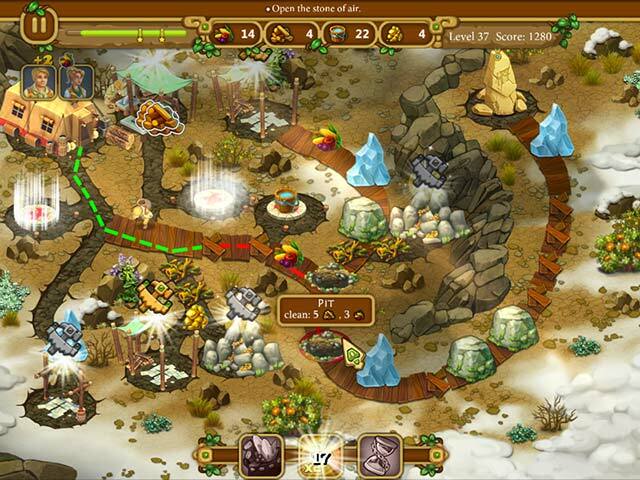 Rated 4 out of 5 by PuzzlesRus from Chase for Adventure: the Lost City I am sorry I wasted a credit on this game. I am stuck on Level 17 and no matter which strategy I use I cannot seem to pass it, I enjoy a game with a good deal of challenge, but not so much that is become frustrating and therefore, no longer fun. At that point, the game ceases being enjoyable. Which, unfortunately it where I am at. Rated 4 out of 5 by cowclaudia from Nice time management game I usually don't buy TM (unless there's a relaxed mode) because I hate to be rushed - took a chance on this one and am enjoying it. Playing on relaxed of course but still fouled up occasionally not planning and having to start over but that's where you have to think ahead with these games. Music is pleasant and not intrusive, graphics are cartoonish but to me adds to the charm, characters aren't annoying so with all of this it's a good addition to my collection when I don't want a play day of doom, gloom and other tragedies. Rated 4 out of 5 by BFFirefly from Decent TM Game Although the game is much like every other TM game where you gather resources and build, I liked it. As you advance, you will need to use a more thoughtful strategy. Great tutorial throughout the demo. Resource menu at the top is a little on the small side for a smaller screen but still readable. Really liked the 3 game modes to choose from, especially Relaxed for those who like TM's without the pressure of a timer. To address a misconception, you are not killing any animals but startling them so they leave of their own accord. The game character uses a gun, shot into the air, to "scare" or banish the animal that blocks your path. As a TM fanatic, while the game wasn't anything extraordinary, I still enjoyed playing the demo and will be purchasing. Give it a try to see if you might like it too. Rated 4 out of 5 by linnovak from Love Time Management! This was a good time management game. There are so few of them that any game is good. Why are there so few produced. Not everyone loves SHOGS!! Not to Big Fish - more time management games are needed! Will play them all! Rated 4 out of 5 by odarney from Standard Time Management - but fun! I'm glad there is a new TM game....it's one of the few I've seen in a while. I like the fact that the characters work quickly - it doesn't take them 15 seconds to remove a blockage. Also, the music is very easy on the ears. The only thing I didn't like was the fact that it takes way too long in between levels for the game to move on. It takes like 30 seconds between each level. But otherwise, I like it. Rated 4 out of 5 by pennmom36 from Searching For Dad This is a decent Time Management game, but there's nothing new offered. You can choose between three different modes of difficulty, Relaxed, Normal and Professional, any of the 45 levels can be replayed, and there is a high scores feature. The graphics are okay, but the music is annoying, in fact after completing each level the music becomes uncomfortably loud for no reason. Ann Windsdoe's father embarked on an archaeological expedition in Madagascar when she was just a child, but never returned. It has been 20 years since that fateful day and Ann has put together a team of her own to explore the same locations as her father before her, and hopefully, find the answers she's been looking for all those year's. 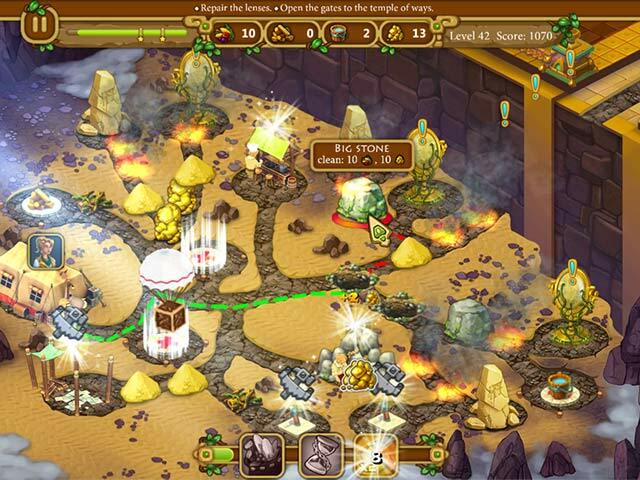 The tasks are the same as most other TM games, gather resources, repair bridges, clear paths, construct and upgrade buildings. There is a bit of strategy to apply, if you don't you will waste valuable time waiting for the right resources to progress, as you become stuck. Really, the only thing different with this TM game is that a helicopter drops unlimited amounts of food onto the landing pad. There is a bonus bar on every level that can be used once charged, to make the workers faster, give you an extra worker, freeze time or add resources, but these features only last for about 15 seconds. One of the locals joins your team as a guide, and he comes in handy to scare away any wild animal that wanders into your camp, once his tent has been erected that is. As I said earlier, this is a decent Time Management game, but there's nothing different about it, even the story is the same. There's nothing that sets this game from the rest and really no incentive to purchase this game over any other Time Management game. Compared to a game like Incredible Dracula which is spooktacular, this game doesn't stand a chance. It certainly is worthy of a credit, but because I have so many other TM games, I'll probably pass on purchasing the game but I did enjoy playing the demo and hopefully you will too! Rated 3 out of 5 by Ani2000 from Challenging but distracting The game itself was ok - a classic time management game. I did finish the game but I didn't find the story line interesting. 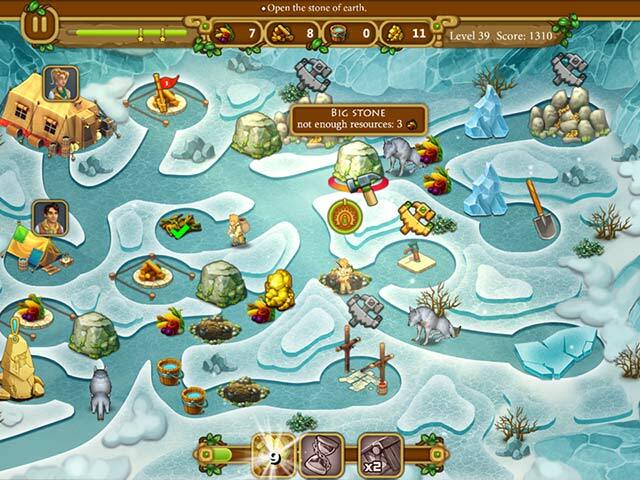 At least half of the levels could not be completed without using the bonuses. I understand using bonuses to speed up gameplay so you get 3 stars instead of 1 or 2 stars. If they are required so you can finish a lot of levels, I think the game needs to be redesigned a bit. The most distracting issue in this game was the poor spelling and grammar in the game. There were mistakes with the instructions or labels on every single level which I found annoying. Rated 3 out of 5 by mrbecker from Poor English is Really Distracting I enjoy TM games and own several. This is a basic example of the genre. It's not as good as the Weather Lord, Moai, or Roads of Rome series, but it's worth playing. The poor English sometimes disrupts the play because you have to stop so you can try to figure out what they're saying. I have noticed other games that have a slight English problem, but this one is the worst I've seen. I don't understand why so many game developers don't have their text proofread. Rated 3 out of 5 by dpollod from Same as Elven Legend The premise of the story is OK but this is pretty much the same as Elven Legend. One thing that is laughable are the English translations. They are really bad! Rated 3 out of 5 by Seji from Just okay I love time management games and play every one I can get my hands on. Most are fast-paced, exciting, visually pleasing and fun to play. This one is NOT any of those things. It was dull, lacked imagination and boring. Try it before you buy it. I won't be buying. Rated 2 out of 5 by nmb_48150 from bad it shouldn't be nearly impossible to get through some levels on relaxed mode. Rated 2 out of 5 by wraecca from Dreadful! Bad english with a poor story and really basic graphics - this seems like a game from the 1990's! Rated 2 out of 5 by bechaupt from Very, very short - only 15 levels This game is okay on most points. Nothing is outstanding but the real major flaw is that it is only 15 levels long. I estimate that it only has a quarter of the game-play you would expect from a standard edition. Very disappointing and I admit I felt ripped off when I realised that was it. I also fails to increase the challenge adequately as the levels progress. There was only 1 level I did not get three stars on at the first attempt. Story is uninspired and misogynistic. Basically boring. Rated 2 out of 5 by plat1098 from Well, That Was Brief I don't like to pan anything and anyone's work, but honestly, I tried, and I am a timed/strategy junky. My assessment of what constitute good graphics includes fine details, well-drawn items, subtle colors, not something a first grader could do. What's up with the worker chopping trees or gold and he's positioned before the actual object on the path? Background music is irritatingly repetitive and the resource symbols are confusingly tiny. Wow, take this one back in for a make-over, it sure could use it. Rated 2 out of 5 by Doylescat from Good game for a 8 year old I'm not a 8 year old therefore I found this game too simple and very boring. Rated 2 out of 5 by ElizabethR1533 from It's okay The format is good, and I like the characters. The graphics and sound effects are good as well. However, this turned into a click-fest far too quickly. The "goods" renew quickly, but you need LOADS to build/finish the level, so you are constantly clicking back and forth, back and forth, back and forth, to get enough food/wood/whatever to build whatever you need. I have played the demo, but am unlikely to buy, simply because of the constantly click-factor. Shame, as it could have been better. Rated 2 out of 5 by MO_Gumbo from Familiar Storyline, plus Violence Toward Animals Same old thing - woman goes out to find missing dad, but immediately meets man whom she invites on her trip. Male characters routinely go on quests by themselves in games. Who thinks a woman must have a man along or she can't cope? I strongly object to the monkeys being shot and, presumably, killed to get them out of the way. They could have been simply chased away. I only played for about ten minutes and quit because of the above. Rated 1 out of 5 by plaintiger from More confusing than anything This game is just confusing for me. I don't understand what makes what happen or not happen (and I'm experienced at games like this - the My Kingdom For The Princess series is among my most-often-played games). I find the bad English kind of charming, myself - probably because I'm part Russian and the English is bad in a plainly Russian way that I find endearing. But I didn't play very long and if the poor English eventually prevents one from understanding enough to progress, that would be less charming. I just didn't enjoy this game much though. Thank you very much, Big Fish, for making all the games available to try for free! That's a huge player benefit I really appreciate and that lets me make informed decisions about which games to spend my credits on. Rated 1 out of 5 by ravenwaift from Terrible grammar makes this not worth the money The English is so terrible in this game I could only play 2 levels- I think it was written in another language and then translated. It was so bad it was distracting. Gonna pass on this one- in fact it is a little insulting that the developer couldn't take the time/money to hire someone to proofread. Rated 1 out of 5 by Cherubabies from BORING and extremely REPETITIVE The amount of clicking in this Game is just ridiculous! It's just clicking and clicking and clicking all the time without end! It would have been better for the Game developers to make it that just passing your Mouse over the supplies collect them instead of all the continuous clicking. Another thing also, if you get stuck and run out of supplies you have to RESTART. No Hint Button. This was a waste of my good Free Coupon. Will uninstall the whole thing and hopefully never see it again! Rated 1 out of 5 by Catmommy7 from Character stuck Every time the girl archaeologist character was activated, she would run to whatever she was supposed to do, and then just lock there. I really wanted to try out this game, because I like these type of challenges, but I couldn't get her to unlock. Very disappointed. Rated 1 out of 5 by hermette from They need a zombie mode for this game It's obvious the graphics are nice, but all it is is click bait. Something appears, >>>> click it. That's pretty much the entire trial time period. I mean really? Young archaeologist Anna Windsdoe learns that her missing father, a great explorer, was looking for a secret city. Can you help her find him?